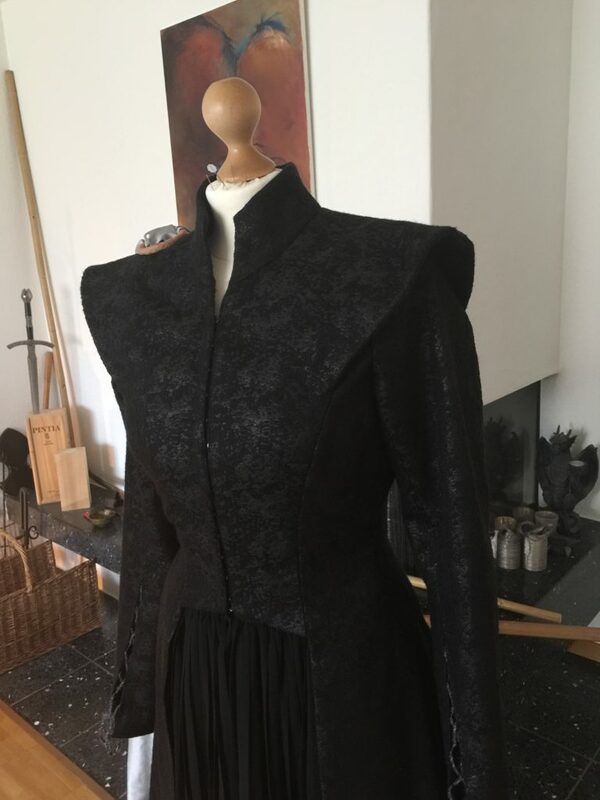 To make my wait more beareable I decided to make several of Danys dresses. 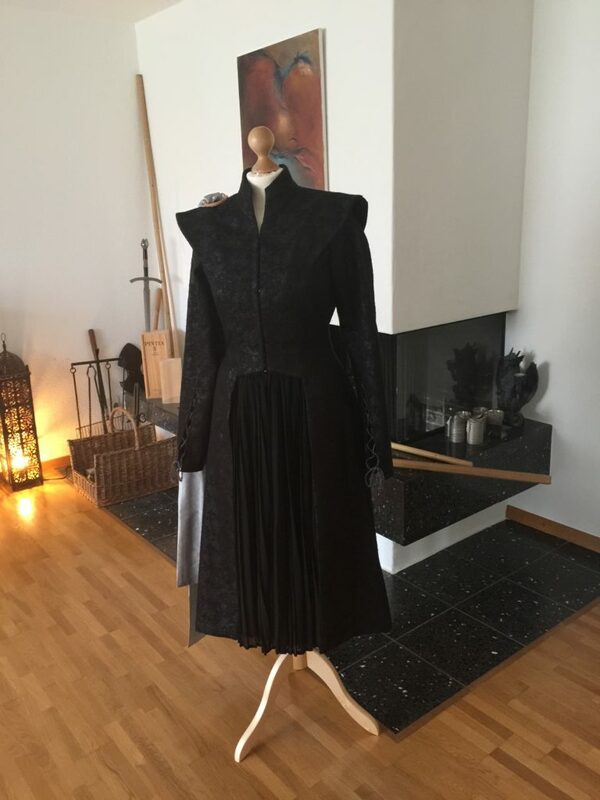 Starting with this lovely dress. 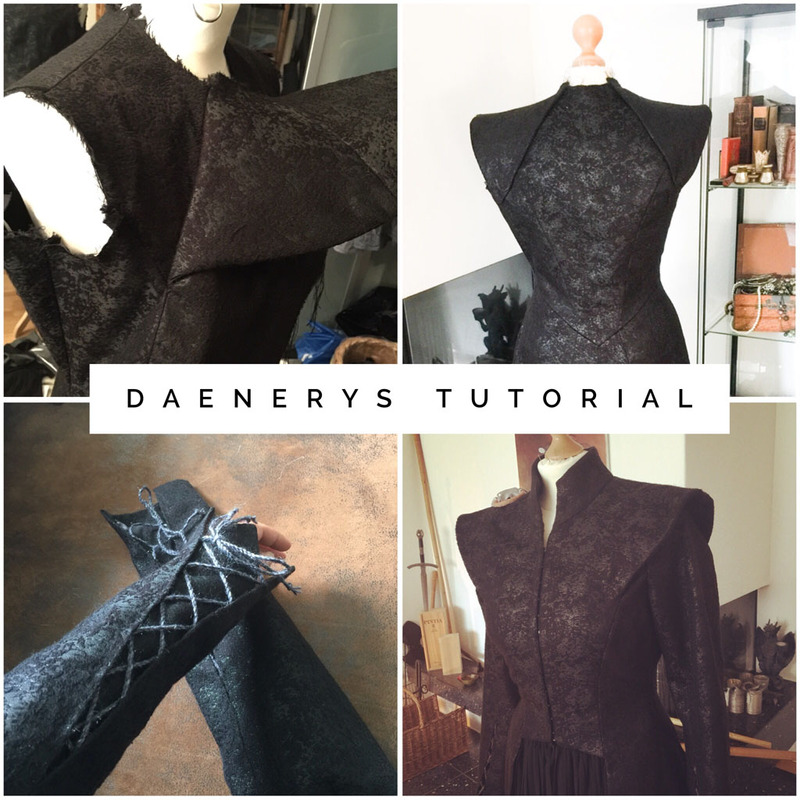 Here's a Tutorial on how I made Daenerys silver black season 7 dress. 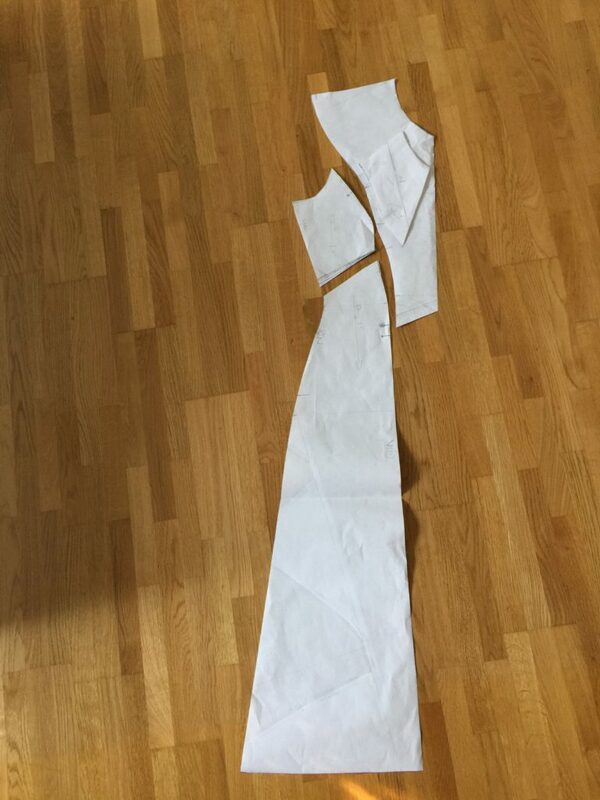 To be honest, the pattern on this dress is pretty complicated... It took me a while to figure it out. 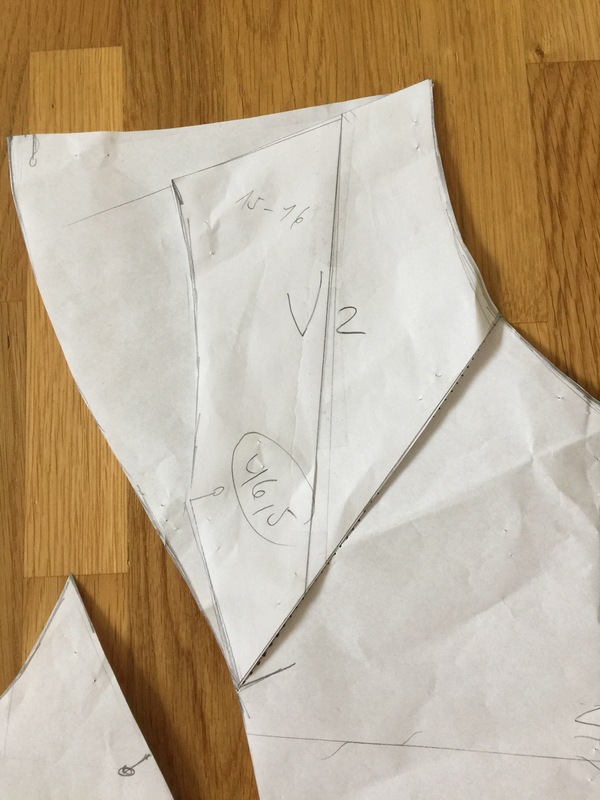 Here's my front pattern. 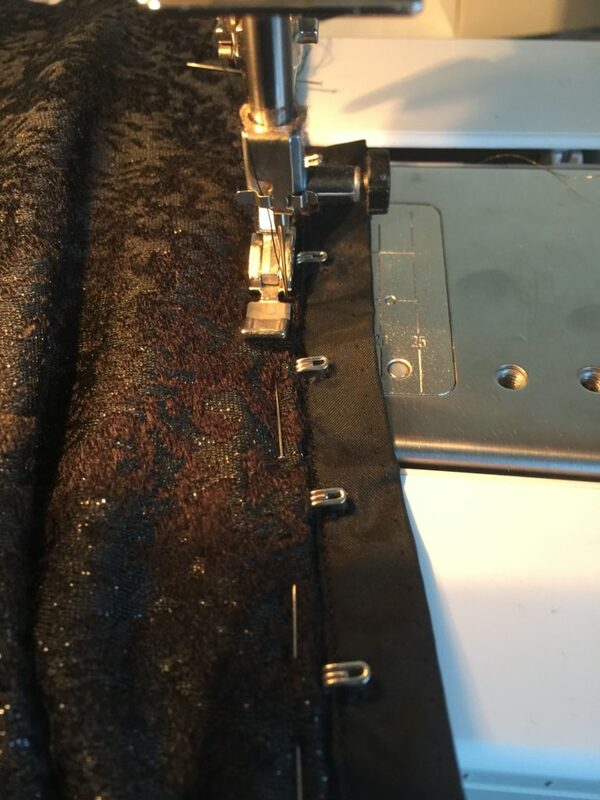 You can see I made a seam just under the breast in the side panel. 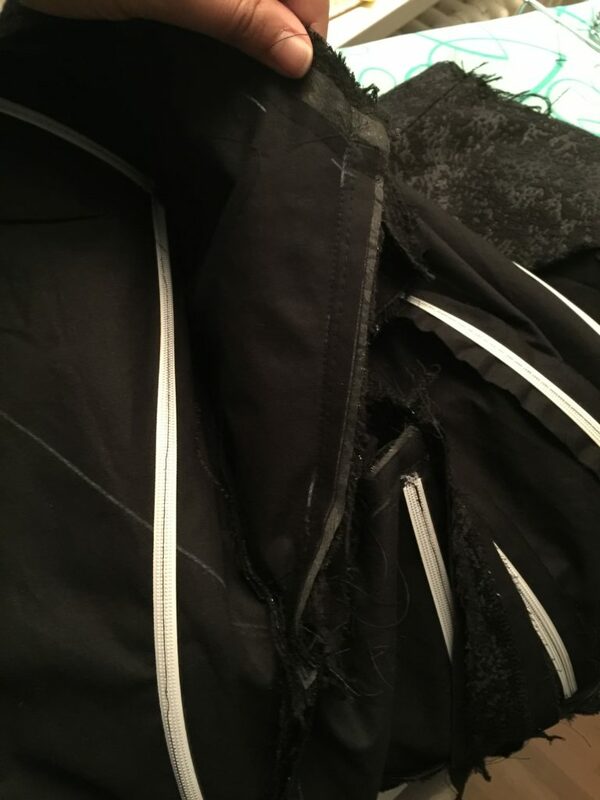 This seam will continue in the back and and in a point in the center of the back. 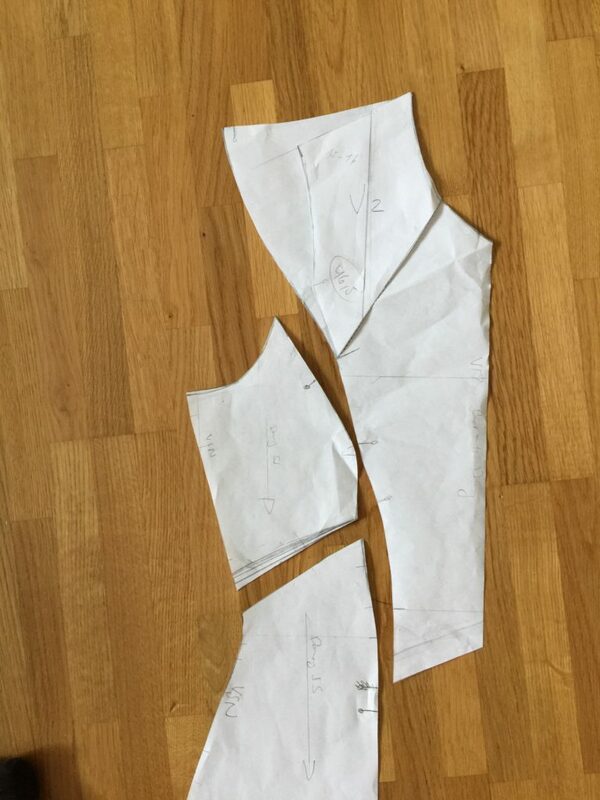 And here is my back pattern and also the back part of the shoulder part above the main pattern. Below you see some closer looks on the pattern. As always: please do at least one mock up. Especially if it is a more complicated pattern. All in all I was pretty happy with my mock up and didn't have to change much. 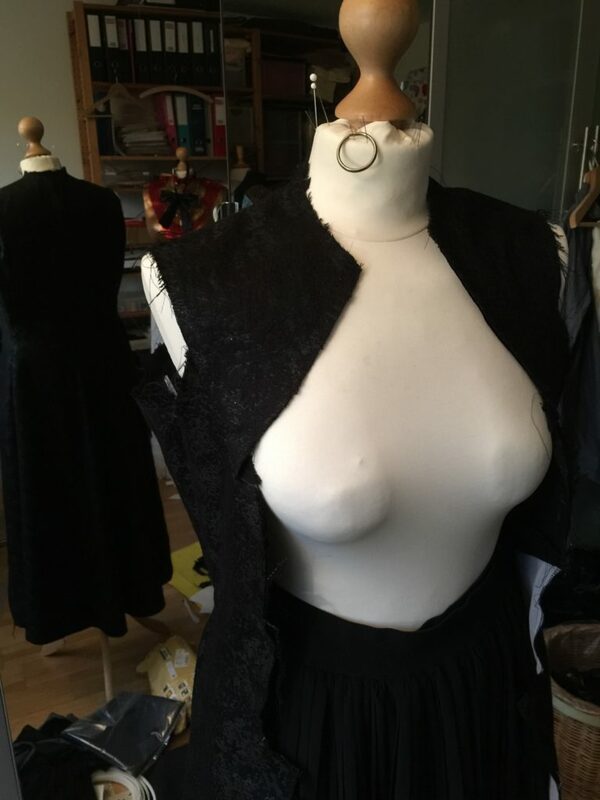 The shoulders where a bit to wide and I took i in a bit around the waist. 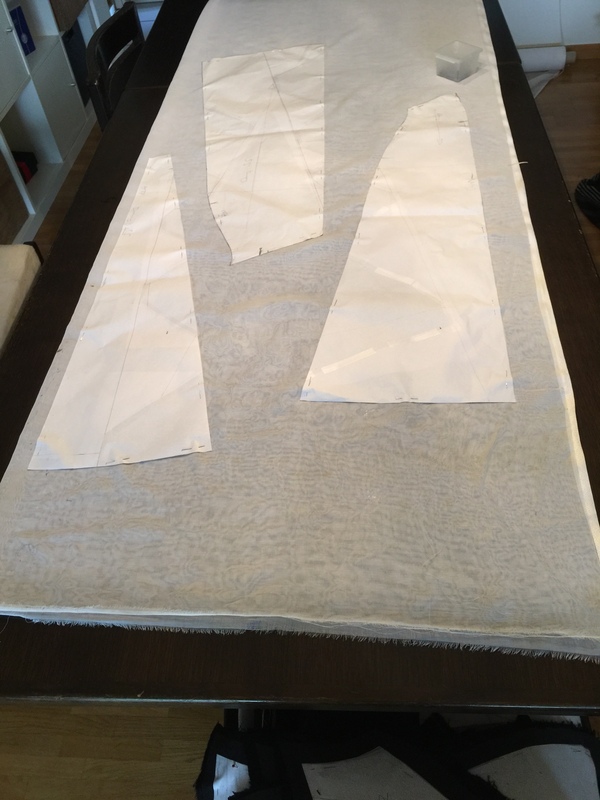 At first I wanted to iron on interfacing to all the pieces. 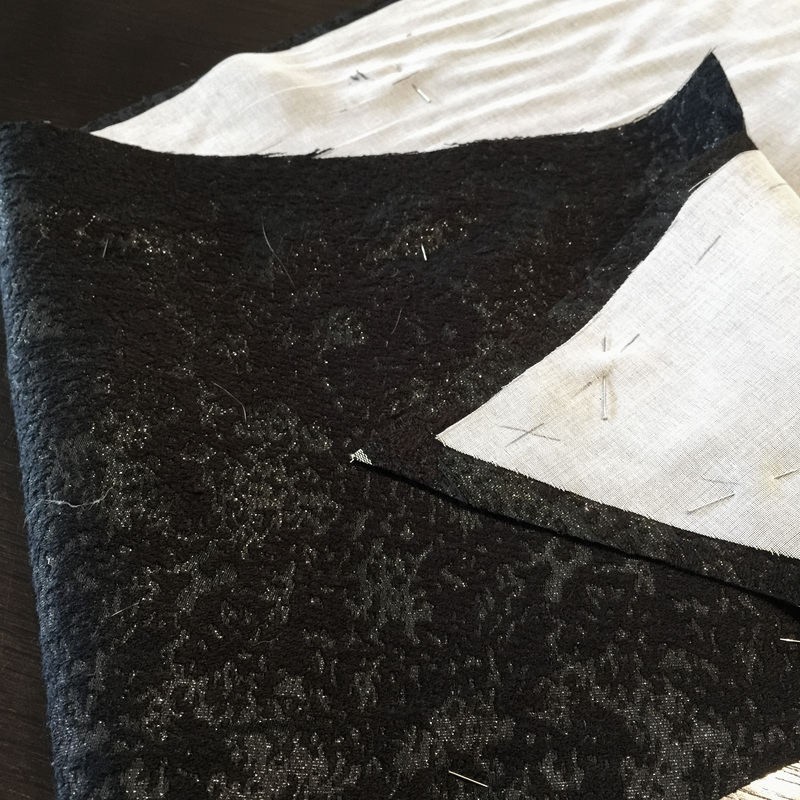 For one to give it more hold and second the fabric is fraying pretty much. 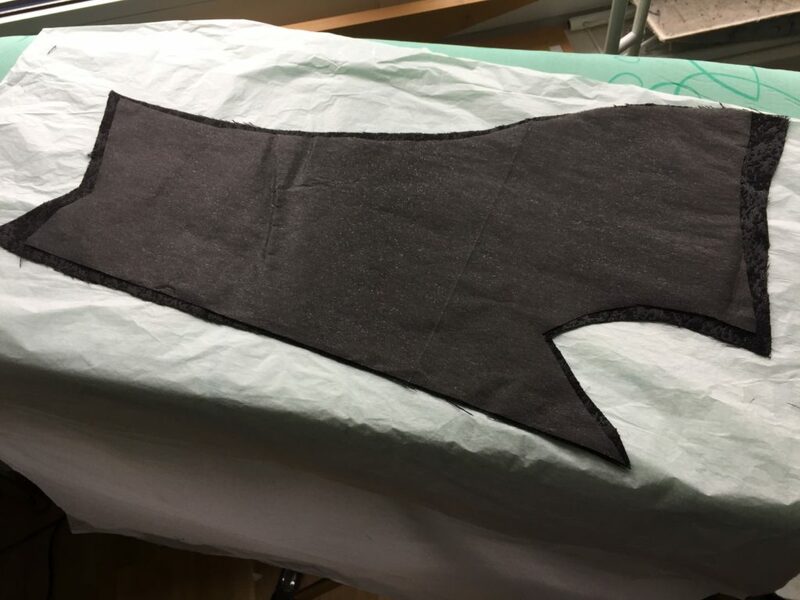 But as I only had thicker interfacing at hand and didn't want to wait, I used a fine fabric as interfacing for the skirt part. 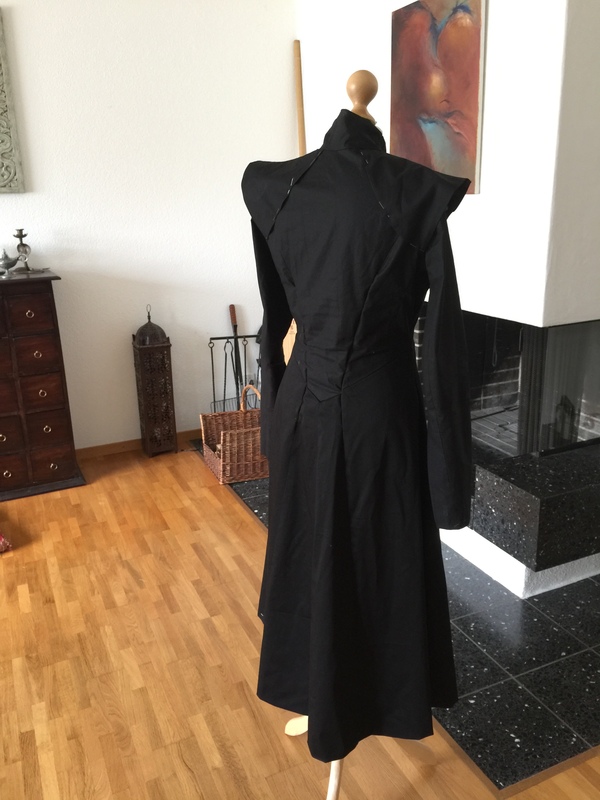 I also added a corset style base to the top of the dress. More on it later. 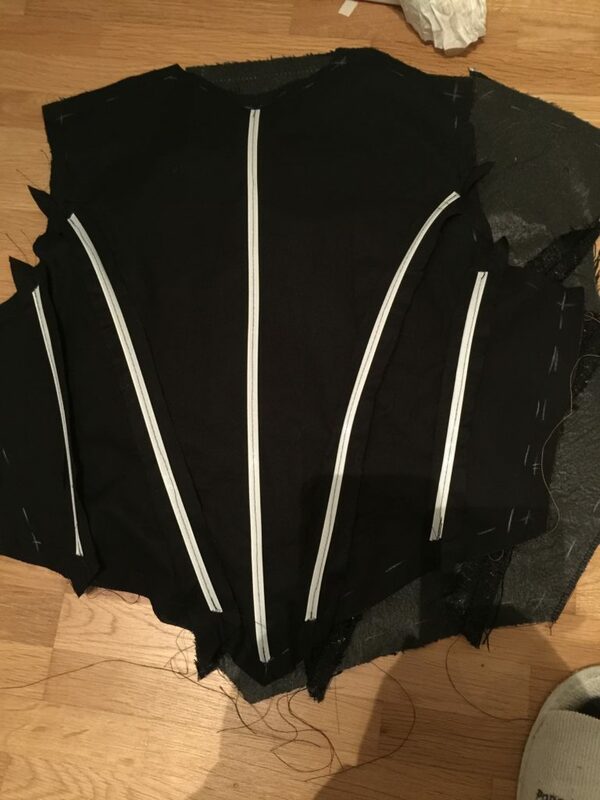 At first I joined together the skirt part, the back of the top and the sleeves. 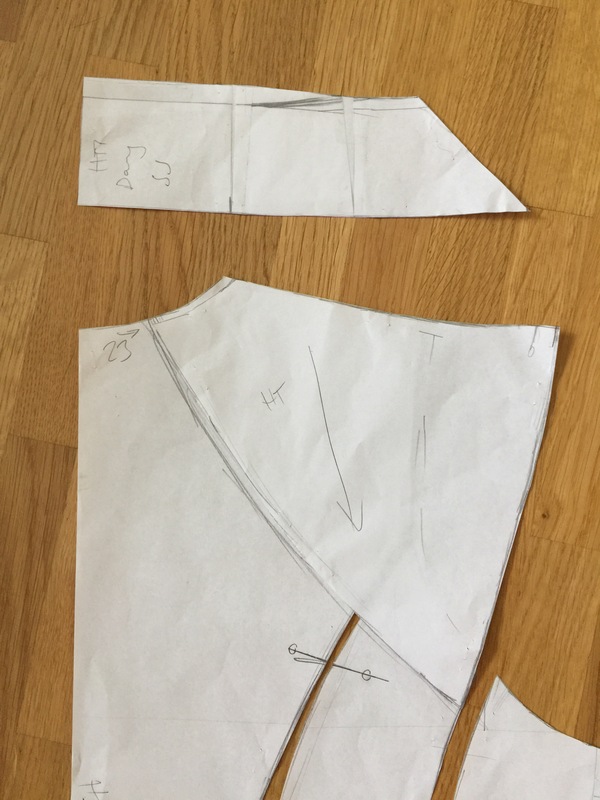 As you can see I added boning right next to the front middle, one on the shoulder seam and one that goes all the way from the bottom to the back end of the shoulder wing. 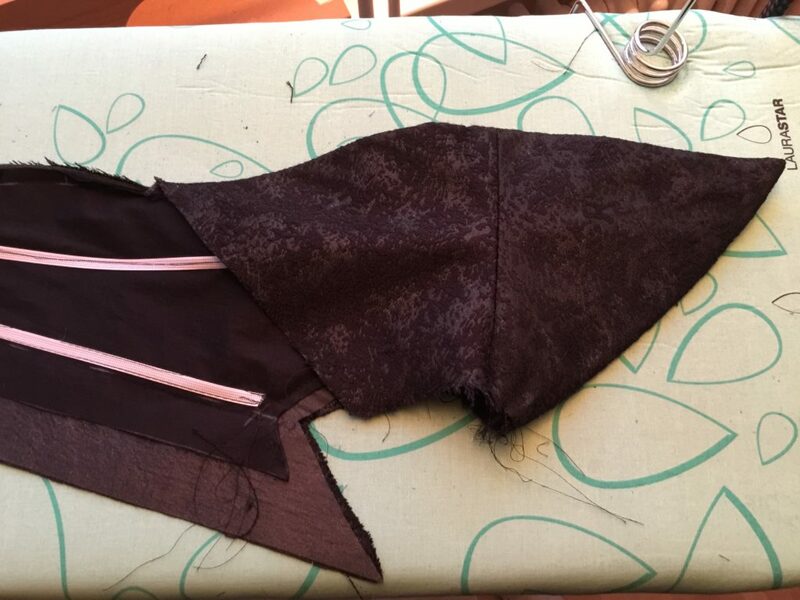 I then joined together the side piece and that little front piece that will be hidden under the shoulder wing. 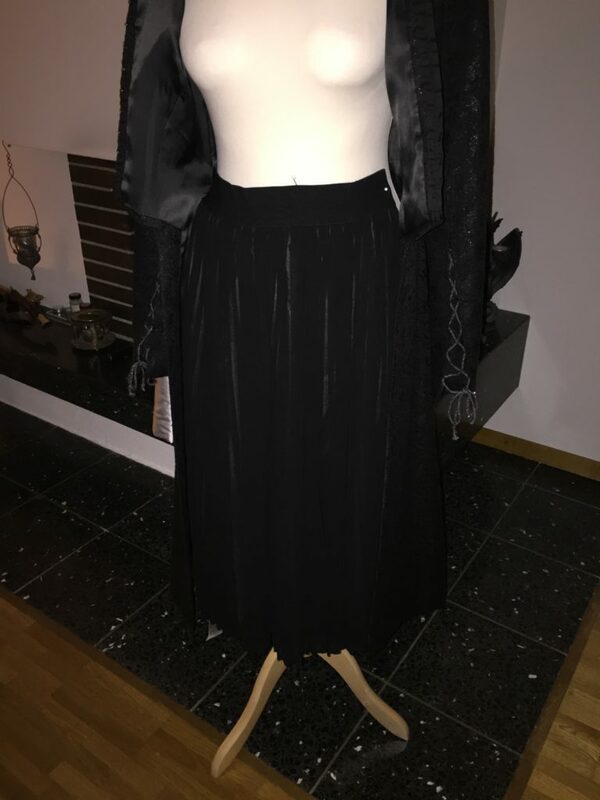 And then I connected the unfinished top to the skirt. 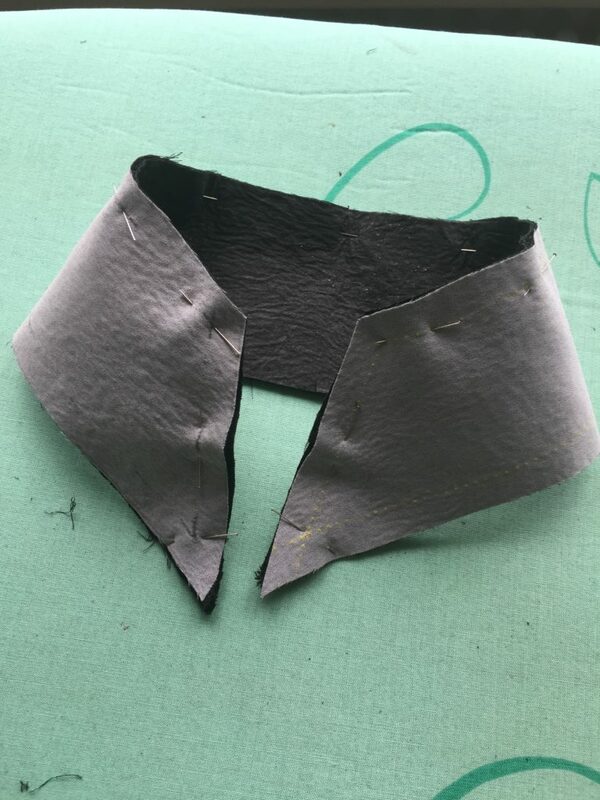 I only sewed the little front piece right to the point on which the shoulder part starts to curve out. 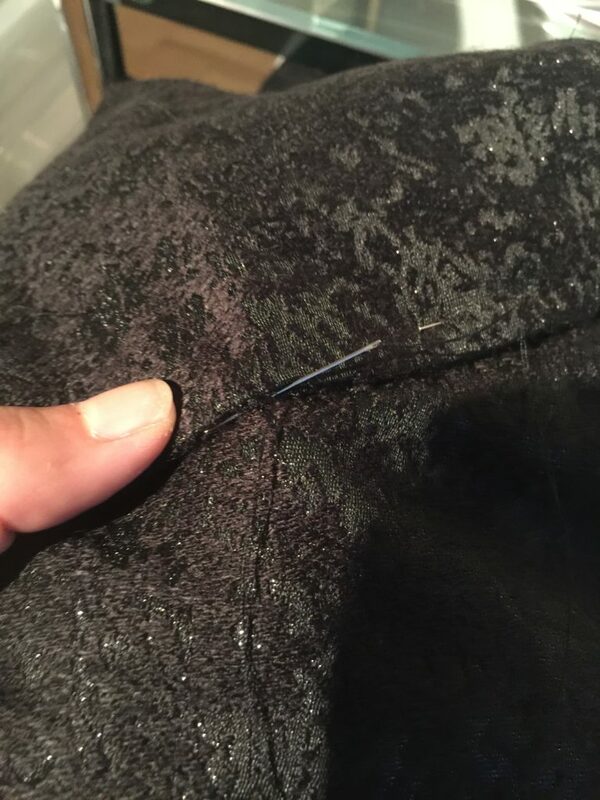 So there is a little seam allowance left. 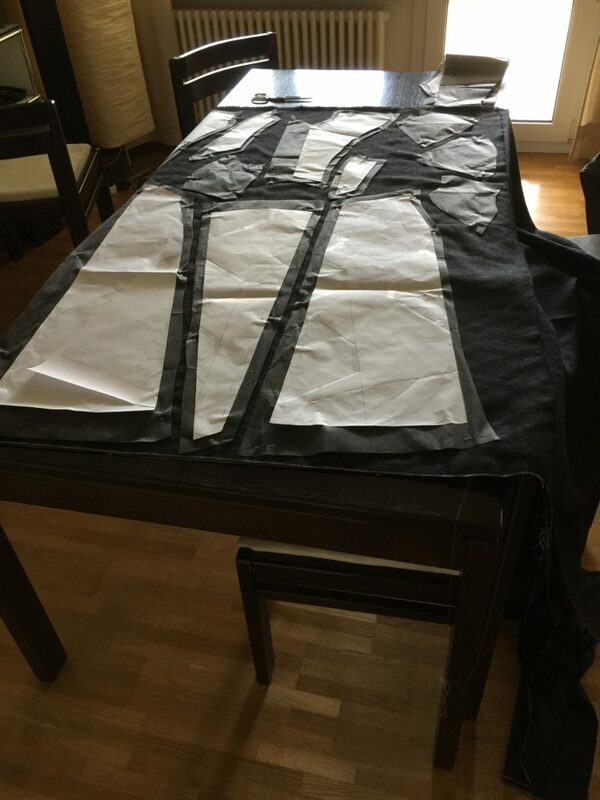 I started with sewing the lining for the shoulder to the front/shoulder part. 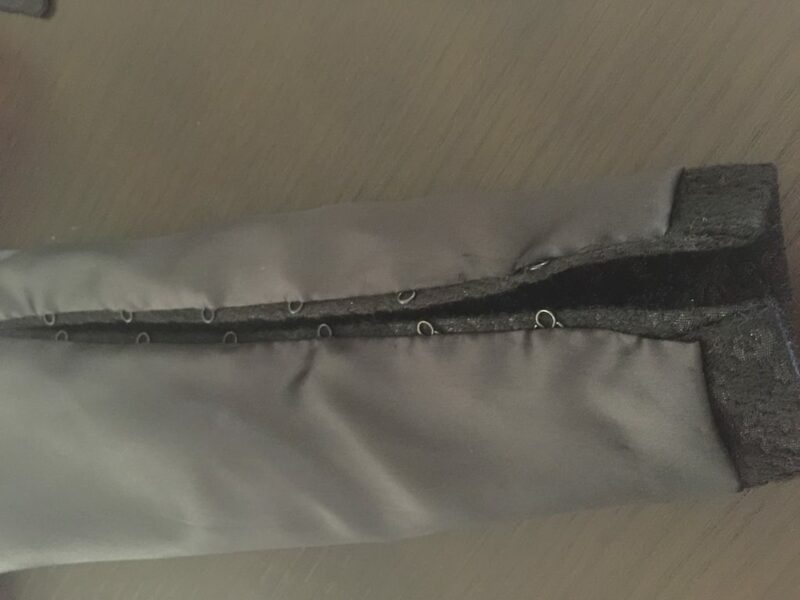 The front half of the lining stops exactly at the same point as the little hidden front piece. 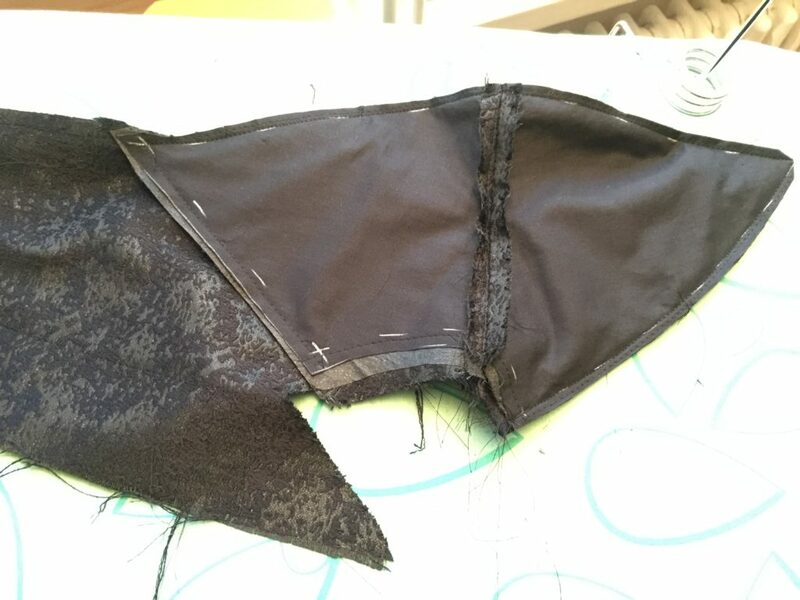 Then I sewed together the front piece to the side piece starting from the bottom to the curve point. 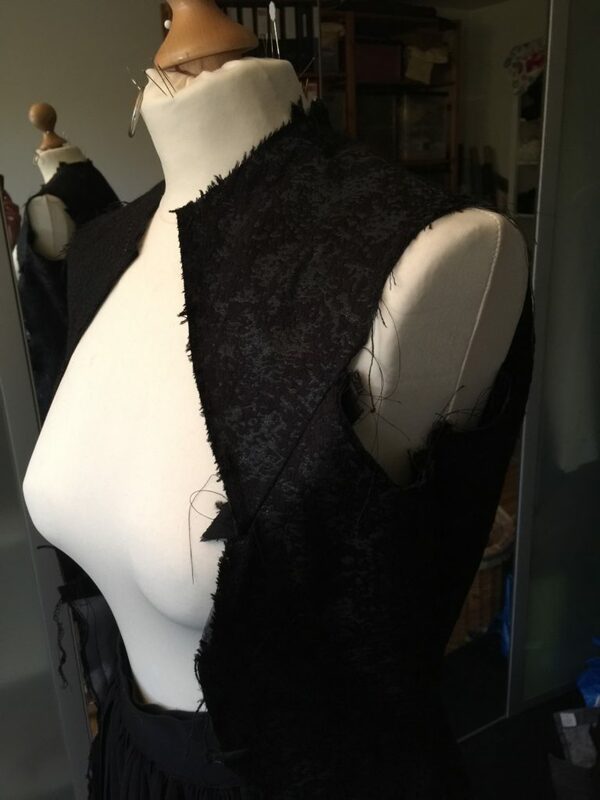 And then I joined the little front piece to lining of the shoulder. 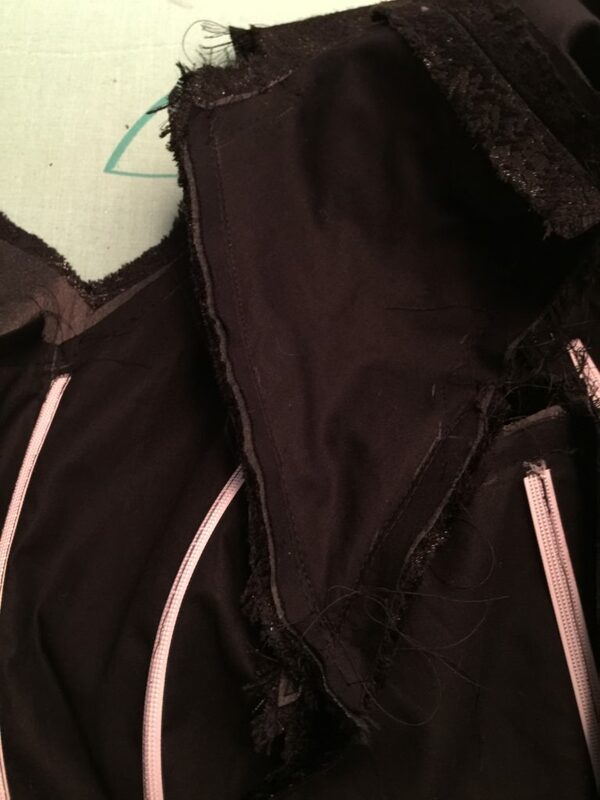 Here you can see that little hidden seam and shoulder thingy from the inside. 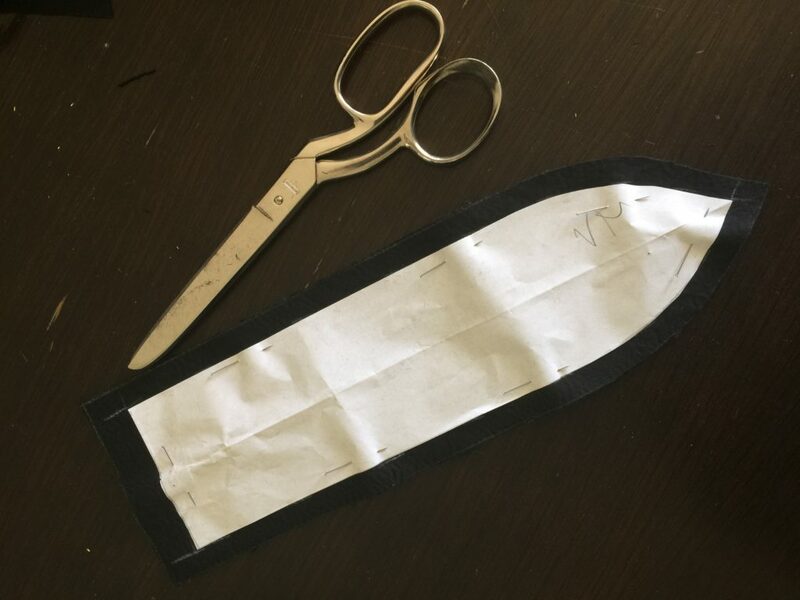 I then hand stitched that seam to the cotton base of the top, so it would slip. 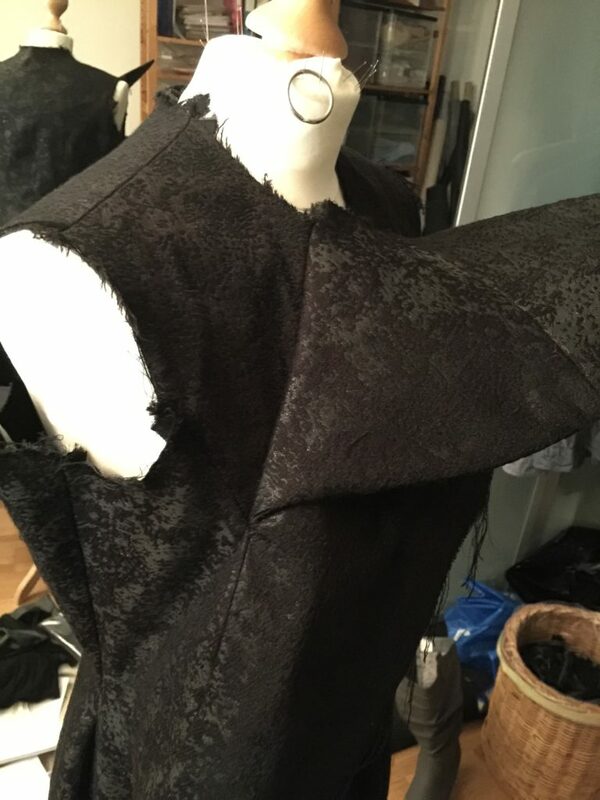 The back of the shoulder thingy I hand sewed to the back of the top. I'm very sorry, but I have literally forgotten to take pictures of this process. 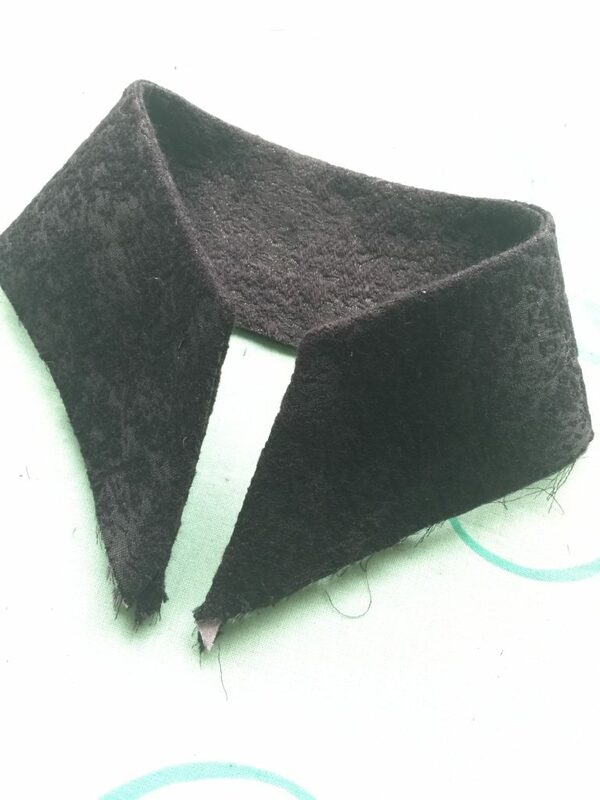 Well here's this one picture of the hook and eye band closure. 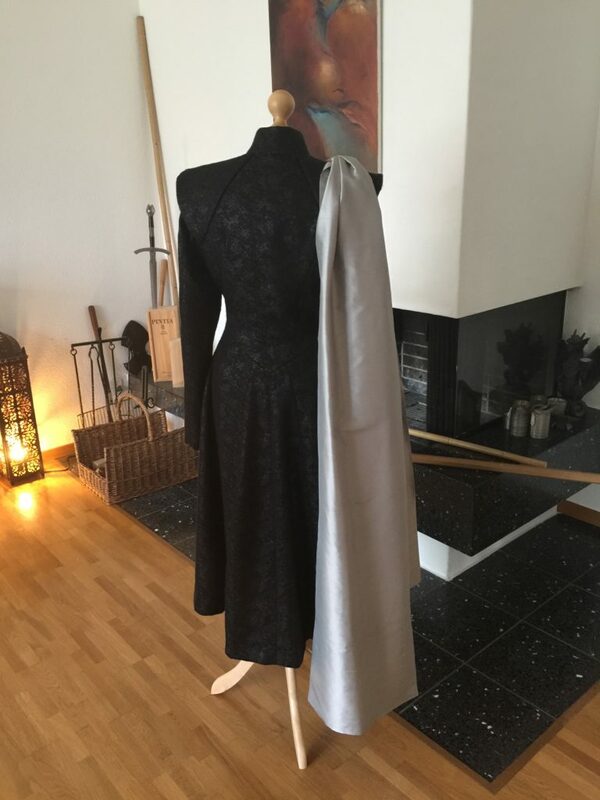 For the lining I used a dark grey satin fabric. 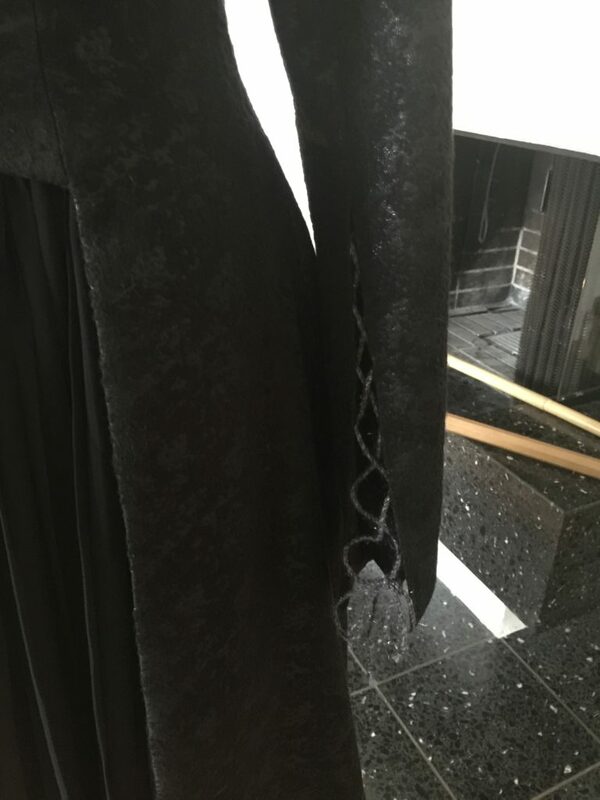 The whole dress is lined with it. 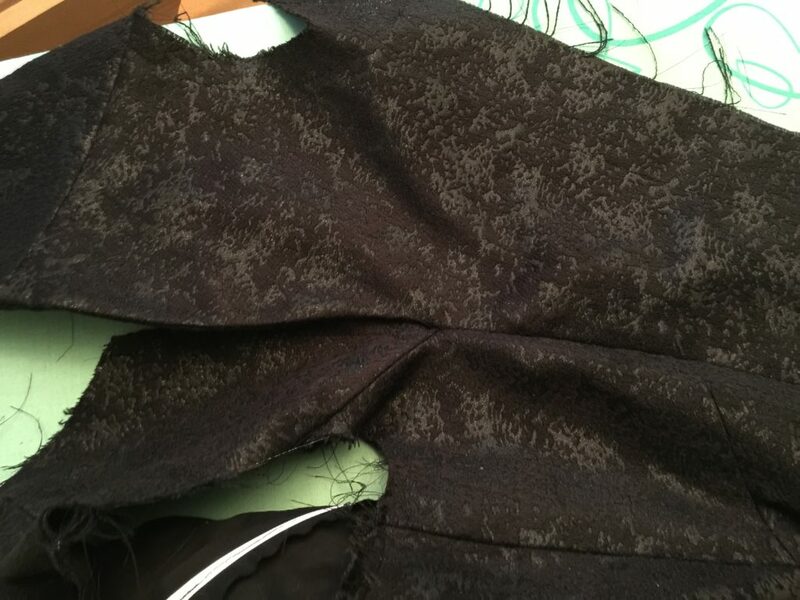 You can see the fabric when I rite to the sleeves next. 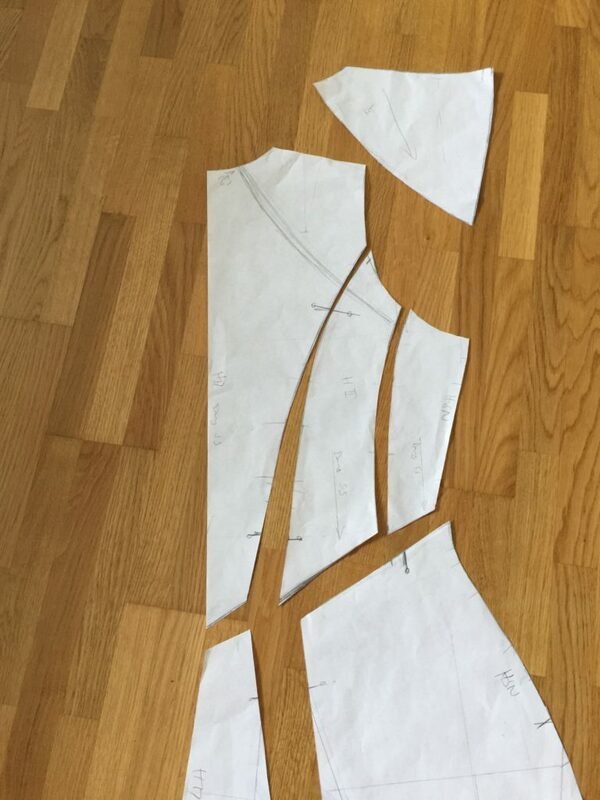 To sew the collar to the dress with all those thick layers... a nightmare. 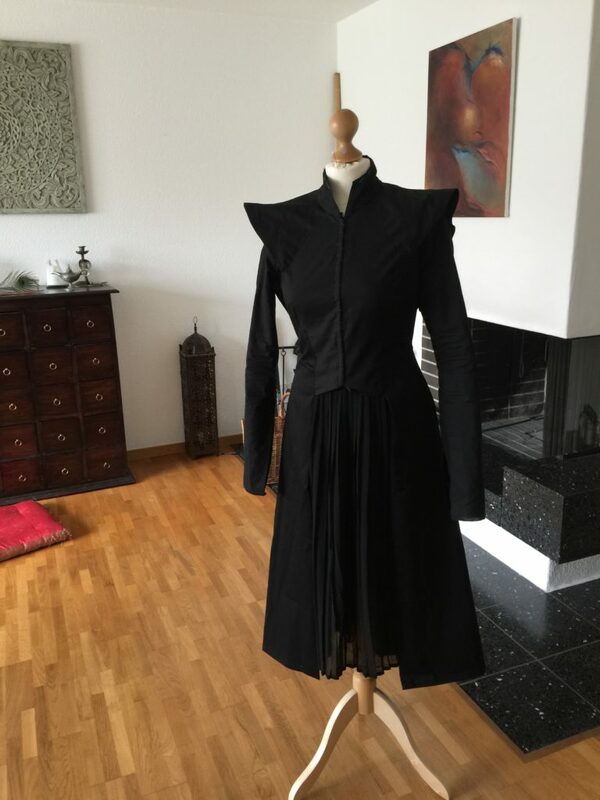 And it's also the part of the dress I like the least. 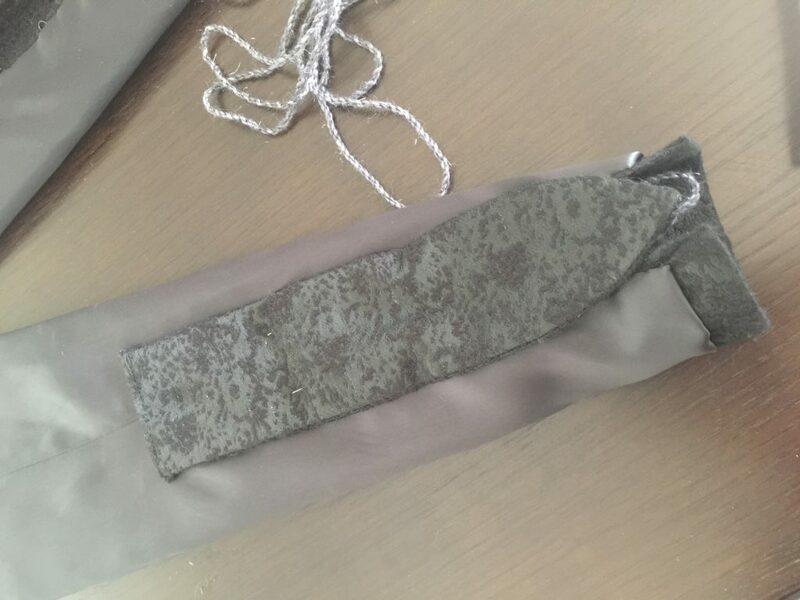 Danys sleeves are laced up at the forearms and under that lacing is a backing which ends in a point. Like on the pictures below. 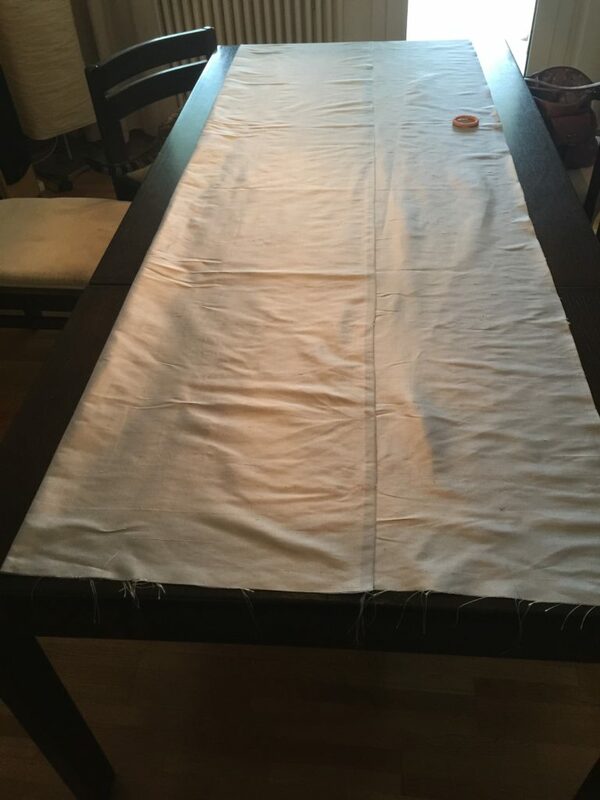 ...and then hand sewed the lining to the sleeves. 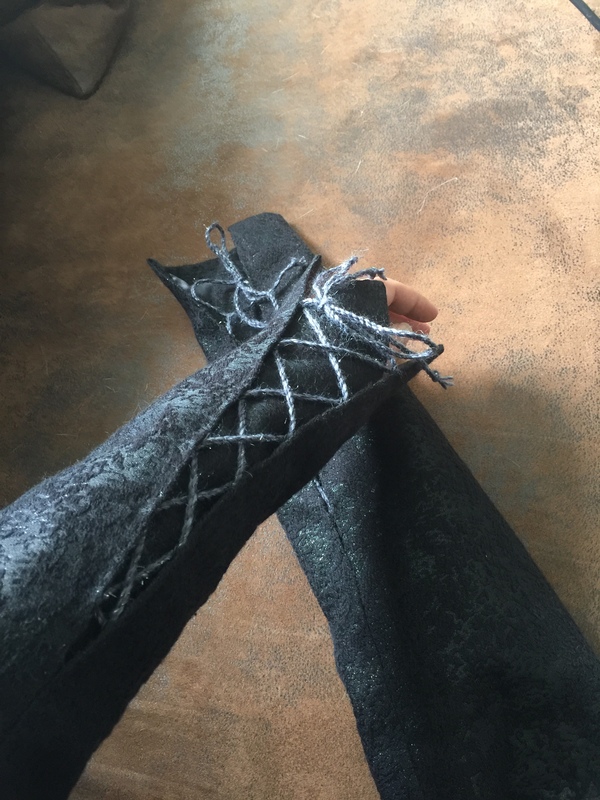 Only then did I hand sew the tongue things to the sleeves. 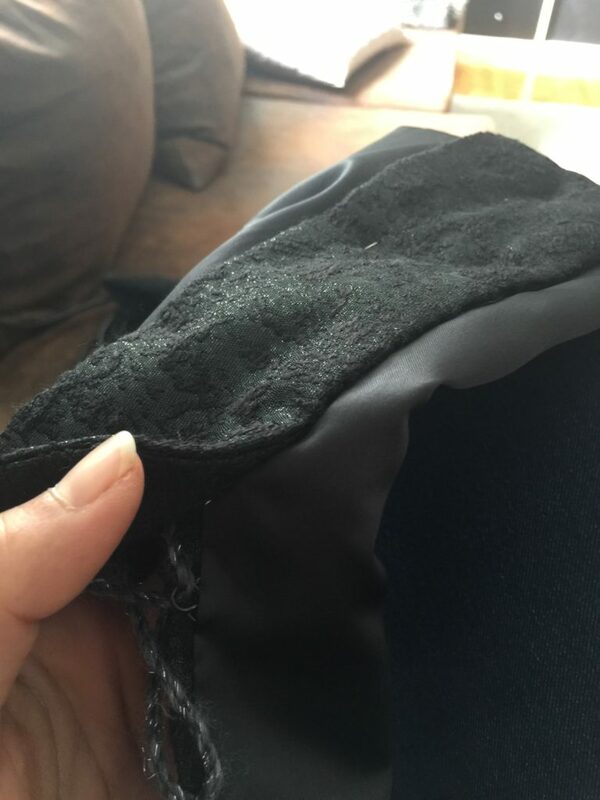 I sewed it down until the point it gets smaller, so it will not slip to one side when I wear it. 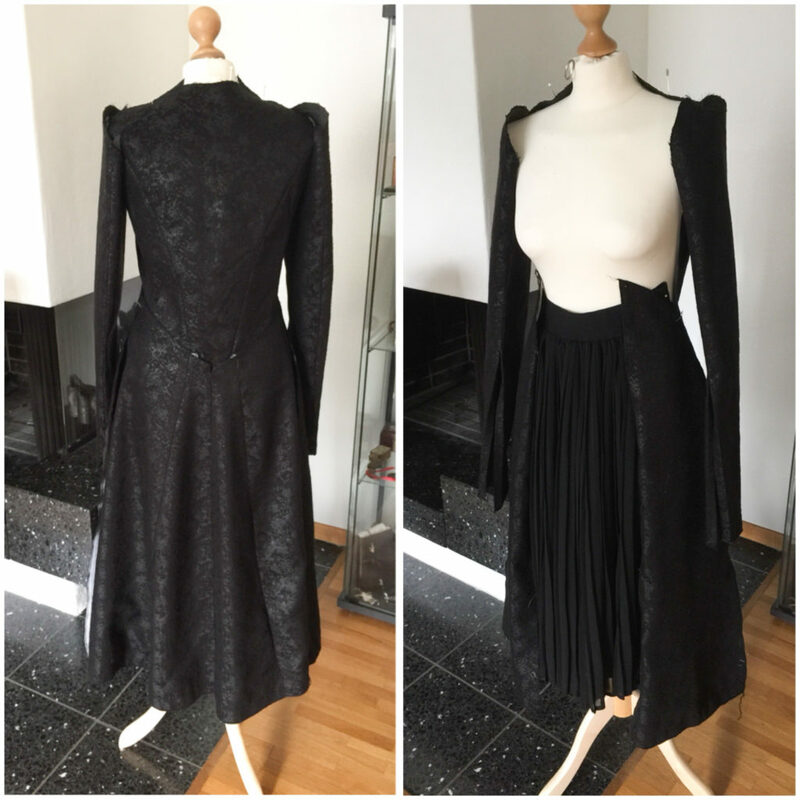 Then I sewed the sleeves to the dress. 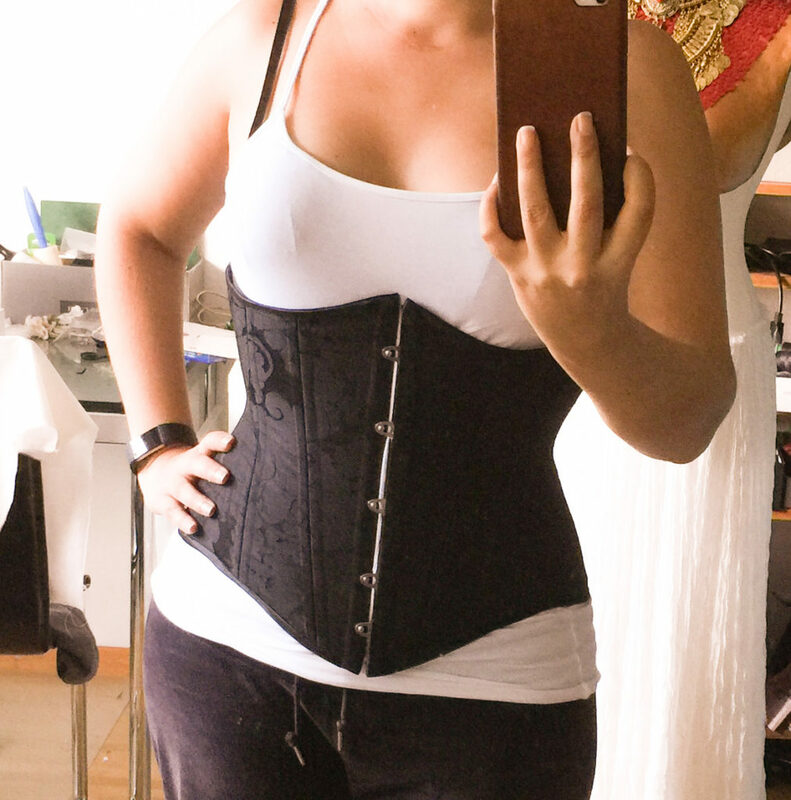 I made this under bust corset to wear under the dress. 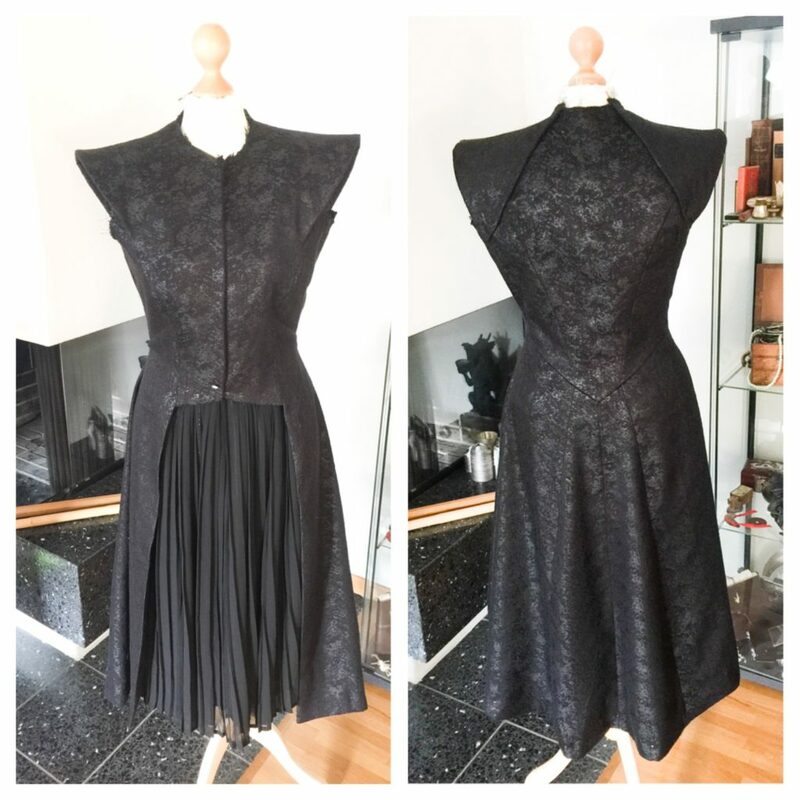 You don't have to wear a corset underneath, but it gives you and the dress extra shape and hold. It doesn't look as neat as in the picture. But absolutely ok for that price! 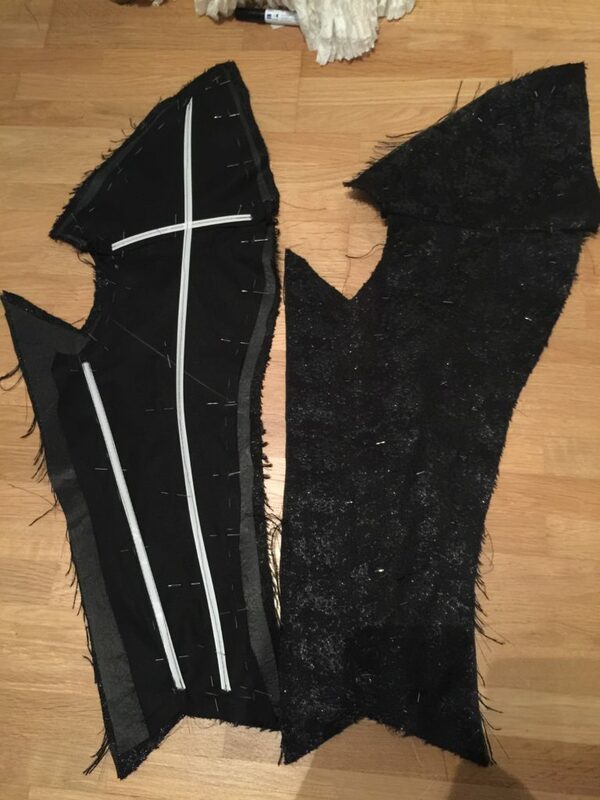 I then took the two skirts apart and joined the the panels together. 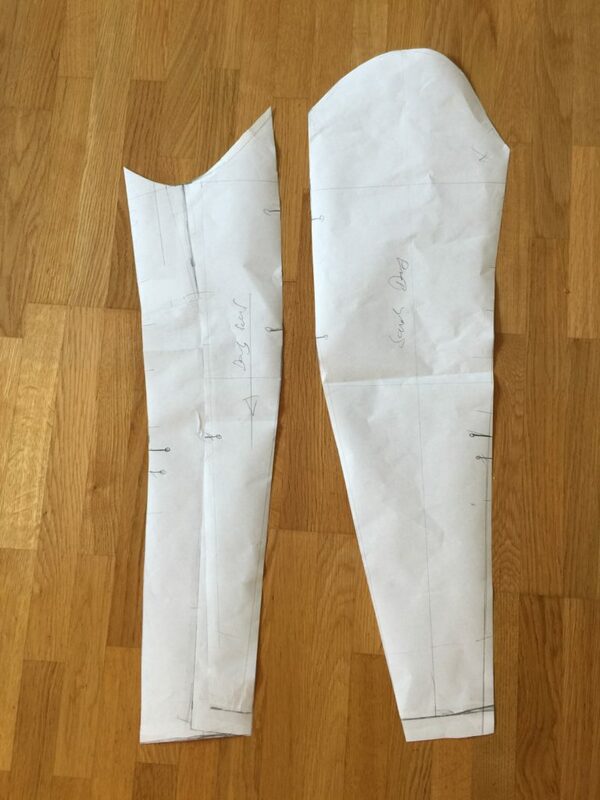 I used only 2 out of 3 from the second skirt. I did this to make it wider. 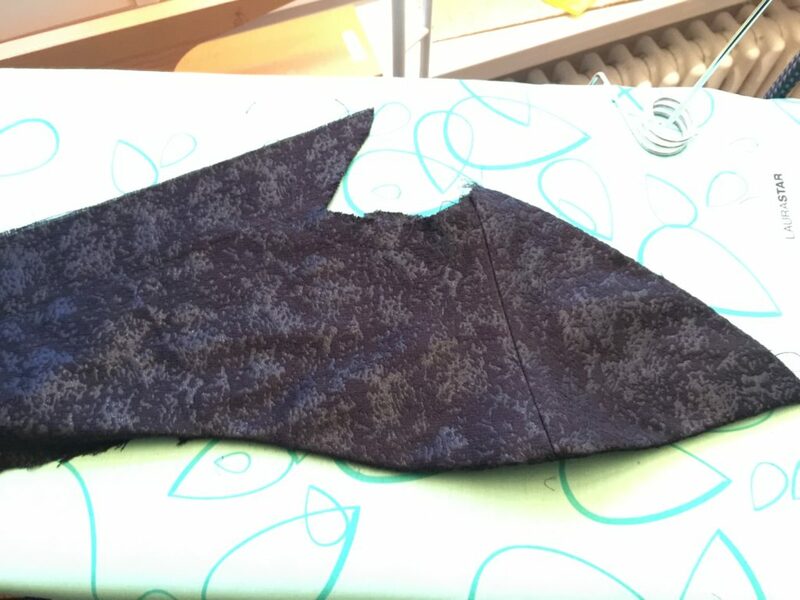 As it's a chiffon fabric and transparent it came with a lining, but only a very short one. 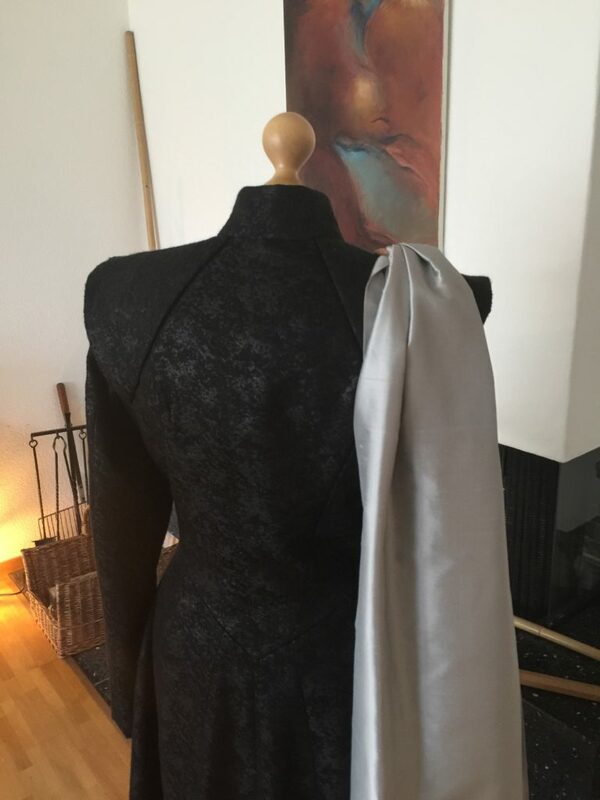 I switched it with this light silvery lining fabric. I think all in all it looks decent enough. 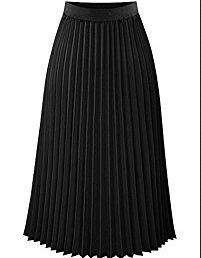 First of all it's not a sun ray pleating like in the original and second it was a bit to short, which leads to the point that bothers me the most. 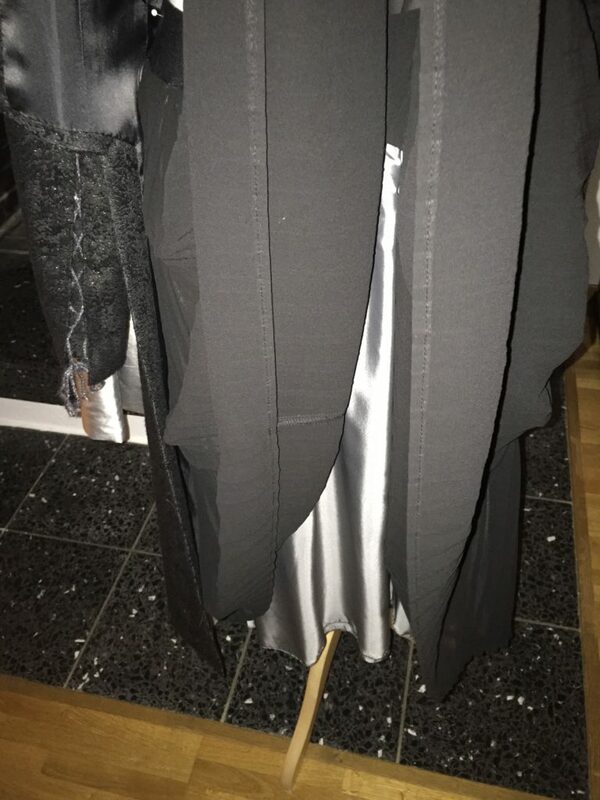 I had to adjust the dress to fit the pleated skirt. I would have made it a few cm longer plus I also had to adjust the chevron part from the top. 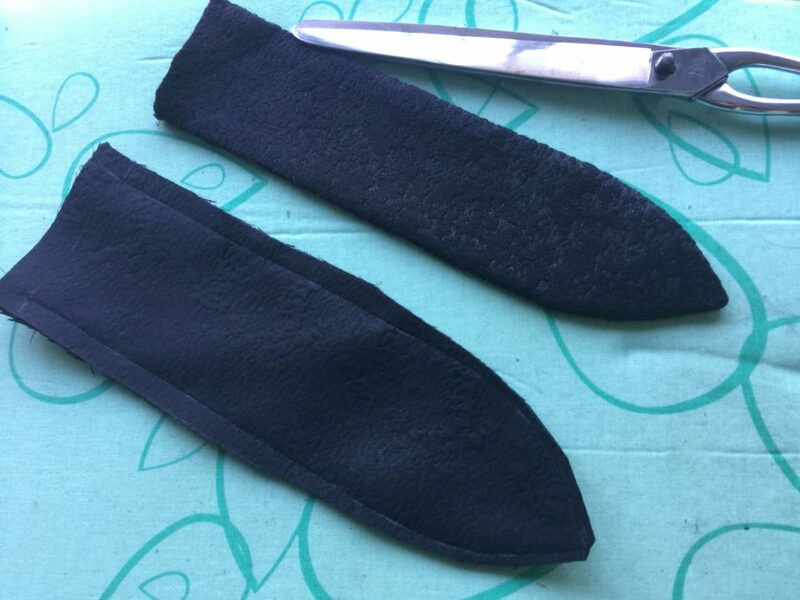 I made mine 2.5 m long and about 42 cm wide. 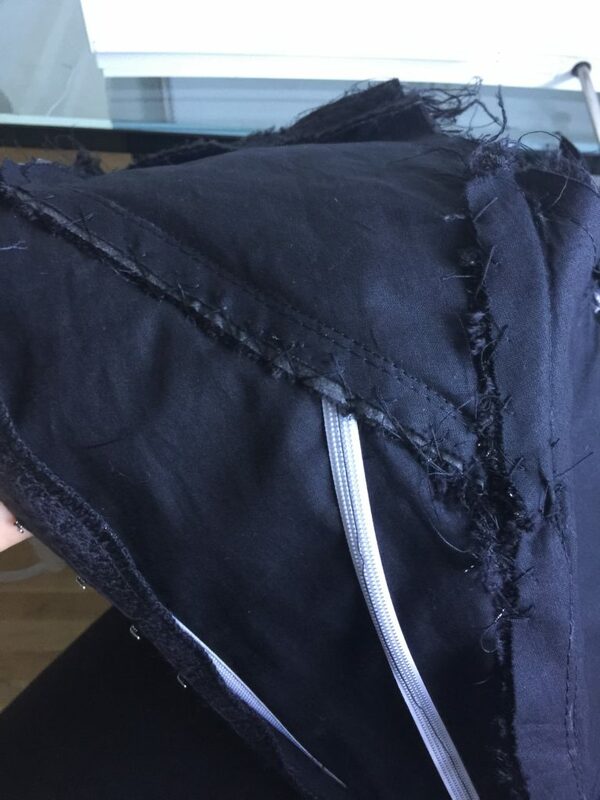 I just folded it over and sewed it together. 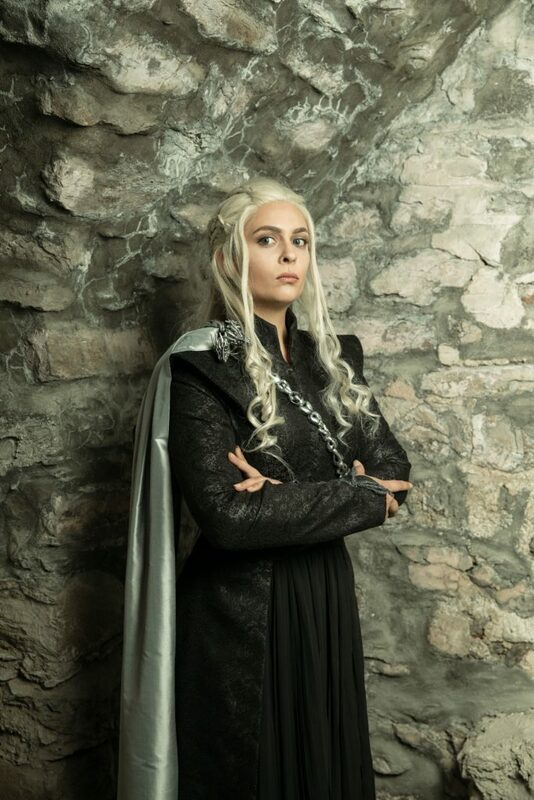 That's it for Daenerys' silvery black dress. I hope you found my tutorial helpful. Please feel free to share it. If you have any question, leave me a comment. Thank you so much for this tutorial! 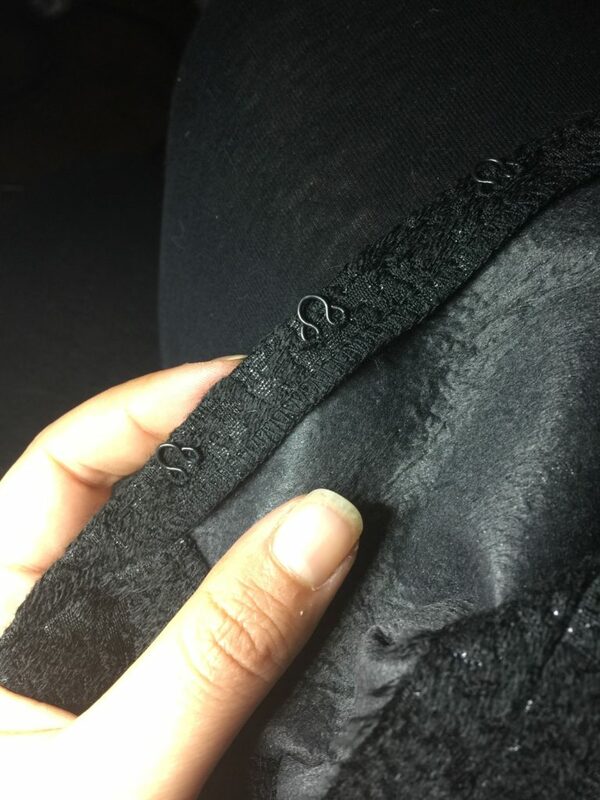 I was wondering, the link for the fabric doesn’t work anymore. 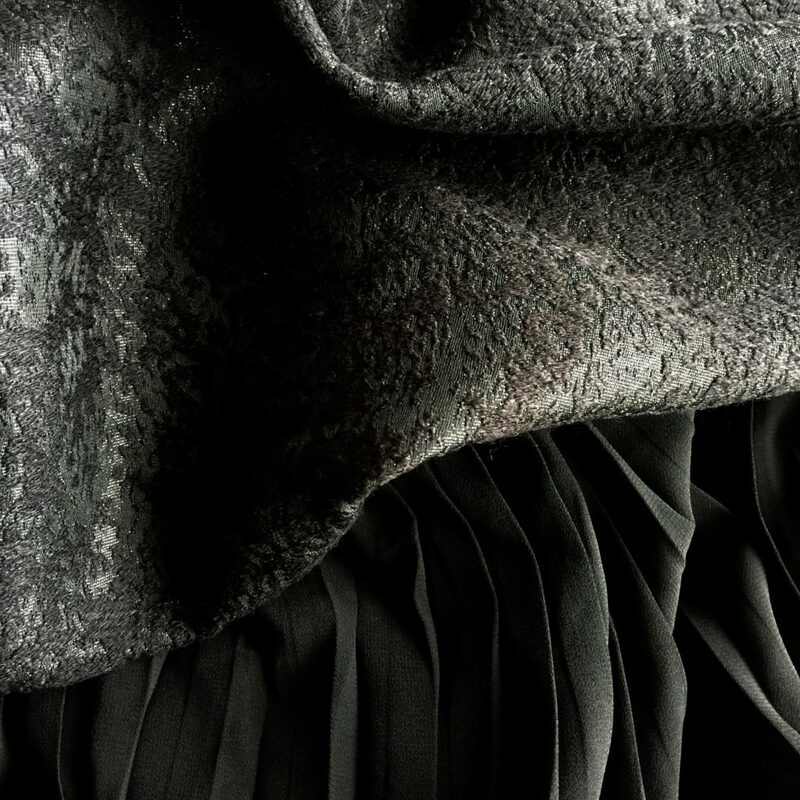 Is there any other place to get fabric like that? I’m very sorry, but I don’t know of another shop that has that fabric. Maybe you can ask the shop directly if they are going to have it back, or if they can tell your where the got it from. 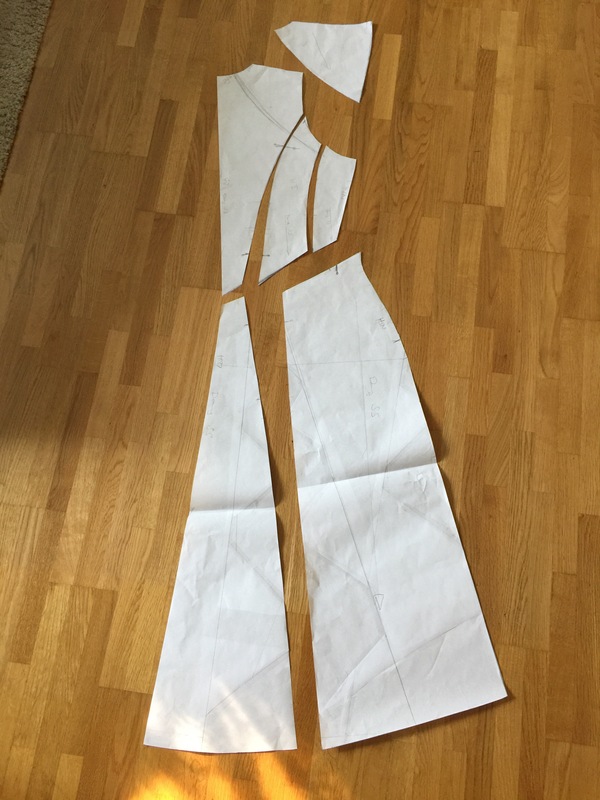 It’s a cosplay shop form France and if I remember correctly they got the fabric from a fabric store in France.